Athlete of the Year, Thomas Barr during the Irish Life Health National Athletics Awards 2018 at the Crowne Plaza Hotel in Blanchardstown, Dublin. Photo: Sam Barnes/Sportsfile. 2344 athletes completed the Annual Waterford AC Half Marathon on Sunday last held in ideal conditions and it was again a very enjoyable and well organised event starting and finishing at the WIT Arena. The race for honours was closely contested from the off between at first four up to halfway and then three athletes went on and ran shoulder to shoulder for the entire race afterwards. The three being Freddie Sittuk the Kenyan who runs with Raheny in Dublin, Thomas Fitzpatrick Tallaght and Thomas Hayes Kilkenny City Harrriers. At the finish there was just 11 seconds between them with Sittuk winning in 68 minutes and one second, Fitzpatrick was second in 68.05 and Hayes third for the second year in a row in 68.12. Olympian Lizzie Lee Leevale Cork, the favourite, won the ladies section in 78 minutes 46 seconds , not far behind her with a superb effort came Ruth Fitzgerald Waterford in 79.42 and Fiona Kehoe Kilmore Co Wexford was third in 82.02, she was second last year. First Waterford athlete home was Andrew Connick Ferrybank AC in 5th place in 70.01 Paul Stephenson from Kilmeaden was sixth in 70.22, he runs with Rathfarnham. The following are all the main results Men 1 F Sittuk (Raheny Shamrocks) 68.01 2 T Fitzpatrick (Tallaght) 68.05 3 Tom Hayes (Kilkenny City Hrs) 68.12. M40 Jeremy O’Donovan (St Finbarr’s) M45 Joe Cunningham do, M50 Brian Gurrin (Kilcoole) M55 Aidan Scully (Clonakilty) M60 Neil Holland (Mallow). Wheelchair Gerry Forde Blarney. Women 1 Lizzie Lee (Leevale) 78.46 2 Ruth Fitzgerald (Waterford) 79.42 3 Fiona Kehoe (Kilmore,Wexford) 82.02 F 35 Caitriona Muldowney (Kilkenny City Hrs) F40 Adele Walh (St Senan’s) F45 Michelle Nolan (Youghal) F50 Joan Ennis (Grange Fermoy) F55 Siobhan Kennedy (Focus on Fitness) The Gardai, Order of Malta many stewards and management and staff at WIT gave very many inputs into the event which was very much appreciated by the organisers Waterford AC and the main sponsors were Hooper Dolan and Ernst and Young. Proceeds going to Waterford Hospice. 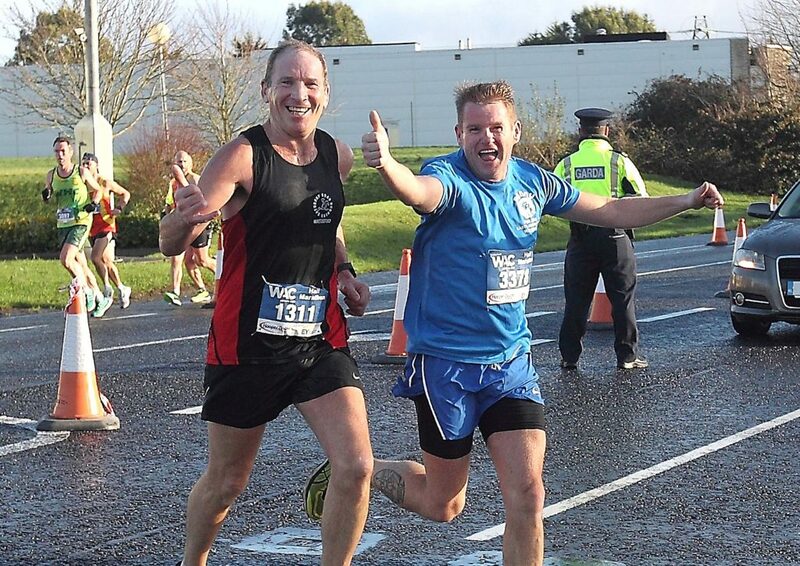 Brendan Doyle, Saturday Road Runners and Trevor Swift, Waterford AC, in full flight during the Waterford AC half marathon on Saturday. Photo: Noel Browne. The Annual National Awards Ceremony took place on Thursday last in “The Crowne Plaza Hotel” in Blanchardstown in Dublin and it turned out to be a memorable occasion for Waterford athletics with three awards coming to the County. For the third time in his career Thomas Barr Ferrybank AC took the Overall Athlete of the Year Award and also the Track and Field Athlete of Year Award, no doubt on the basis of his third placing at the European Championships in the 400 metres hurdles final. He also won the awards in 2015 and 2016. Others nominated were sprinter Phil Healy Bandon, middle distance runner Ciara Mageehan UCD and sprinter Leon Reid Menapians Wexford. 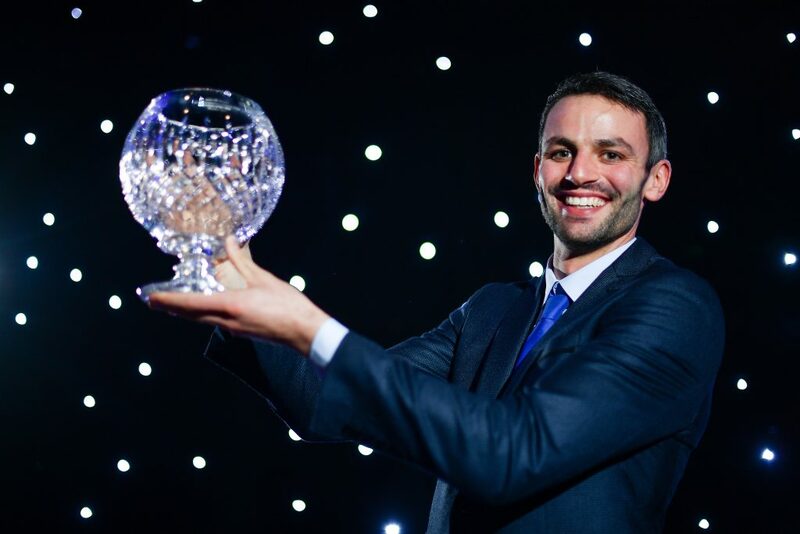 Joe Gough West Waterford took the Master’s Award after a terrific season which saw him win the World Master’s 800 and 1500 metres as well as the European Indoor 800 and 1500 metres over 65 and West Waterford got the Development Club of year award. Congratulations to all.